The hopes and dreams of Mashpee National Wildlife Refuge recently went up in smoke and that’s just the way the refuge wanted it. For years, regional fire and refuge staff worked to return fire to the land as part of a plan to reduce fire risk to neighboring communities and maintain wildlife habitat, including that of the rare New England cottontail. Finally, all the planning became reality as the refuge successfully completed a 10-acre controlled (prescribed) burn in the Town of Mashpee on April 5. “It all started in 2006 when we set up a team to assess the wildfire risk to the refuge”, said U.S. Fish and Wildlife Service Regional Fire Planner Rick Vollick. Mashpee, located on Cape Cod, had been identified by the State of Massachusetts in 2001 as a community near federal land that was at risk of wildfire. The team included representatives of refuge landowners such as the U.S. Fish and Wildlife Service, Town of Mashpee, State of Massachusetts, Waquoit Bay National Estuarine Research Reserve, and the Mashpee Wampanoag Indian Tribal Council, Inc. Mashpee National Wildlife Refuge is unique in that the U.S. Fish and Wildlife Service owns less than 10 percent of the almost 6,000-acre refuge. Once an area that burned frequently with natural fires, Cape Cod is now a tinderbox with an understory of tall oak shrubs. Combined with a canopy of pitch pines with flammable resins, the oaks pose a hazard for carrying any fire on the ground up into the tops of trees. There, fires can burn explosively and throw sparks which can blow in the wind for miles and ignite buildings. 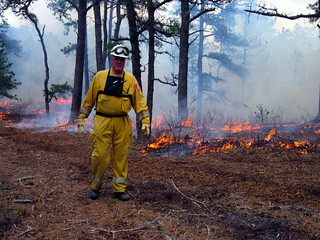 In 2009 and 2010, refuge partners completed first steps of a plan to reduce fire hazard developed by the assessment team, and written by Joel Carlson of Northeast Forest and Fire Management, LLC . They improved fire truck access and fire breaks by clearing trees and brush along refuge roads using chainsaws and small tractors with a grinding head. The next step was to use prescribed fire to clear the understory by burning the oak “ladder fuels”. Breathing fire back into Cape Cod protects homes for people by reducing fire risk, but it also improves habitat for the New England Cottontail, a candidate for listing under the endangered species act. 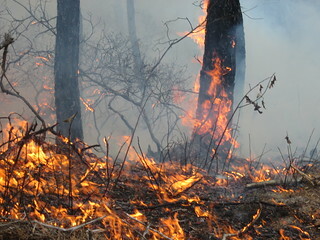 Although tall, scraggly oaks above ground are consumed by controlled burns, fire stimulates sprouting from below, promoting a dense thicket preferred by the rabbits. Pitch pines, with fire resistant bark, are not harmed. Firefighter Kate Iaquinto of the U.S. Fish and Wildlife Service staffs an engine while doing a controlled burn to reduce fire risk to homes in the background. Chief Baker walks the west flank of the burn. An aerial view shows home protected by reducting fire risk in the forest..
Fire laps a pitch pine, but thick bark protects it from harm. In 2008, a wildland fuel hazard assessment to determine risk of wildfire in and around Mashpee National Wildlife Refuge identified clearing roads to improve access and protect firefighter safety as the highest priority. The refuge, in conjunction with Massachusetts Departments of Recreation and Conservation, and Fish and Game, the Town of Mashpee, and the Wampanag Indian Tribe, cleared over 64,000 feet of roads in 2009. An additional 20 acres of road-clearing was planned for late 2010. 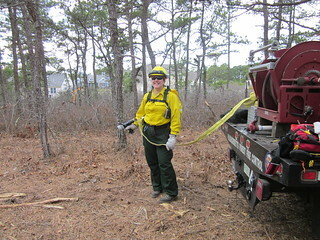 In 2009, Fish and Wildlife Service firefighter Tracy Gingrich worked on the road-clearing project at Mashpee National Wildlife Refuge. Little did he know his actions would prevent a fellow firefighter from sustaining serious injury a year later. Gingrich, stationed out of Wallkill River National Wildlife Refuge, was one of several Service firefighters sawing trees and clearing brush. Occasionally members of Mashpee Fire and Rescue stopped by to monitor progress and chat. On one of those visits, Gingrich was asked about the clothes he wore while using a chainsaw. He explained that the U.S. Fish and Wildlife Service requires wearing chainsaw chaps and other personal protective equipment (PPE) when operating chainsaws. As a result, Mashpee Fire and Rescue equipped all of their brush trucks with chainsaw chaps. On the morning of July 7, 2010, Mashpee Fire and Rescue and their mutual aid partners returned to the site of a 7-acre brushfire. A mutual aid firefighter was instructed to wear proper PPE before using a chainsaw to cut down trees. As he felled one tree, his saw bucked and bounced off him, but he was not injured because he was wearing chainsaw chaps. “Had we not had the interaction with firefighter Gingrich, I am sure that the operator would have been badly injured,” said George Baker, Chief of Mashpee Fire and Rescue.